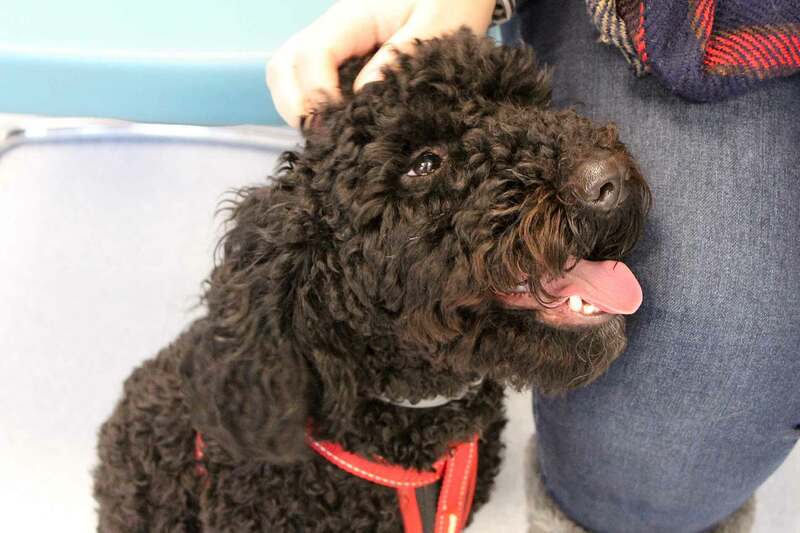 Ezra, a one year five month male neutered Poodle cross, was referred to Lumbry Park Veterinary Specialists for assessment and treatment of a suspected spinal fracture following a road traffic accident. Ezra was first received by our Emergency and Critical Care service. 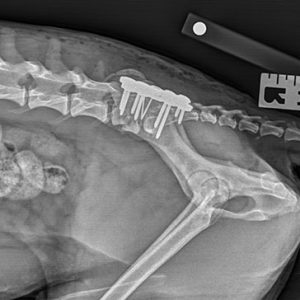 On presentation Ezra was recumbent and immobilized, as had been recommended by our ECC Specialist, Dr Adam Mugford during discussion with the referring vet prior to Ezra’s transfer. On examination Ezra was unable to bear weight on the left pelvic limb, exhibited reluctance to bear weight on the right pelvic limb, and severe pain was elicited on palpation of the hips and lumbar area. There was hindlimb paraparesis. An abdominal FAST scan was performed which did not demonstrate any free abdominal fluid and haematology/biochemistry was unremarkable. 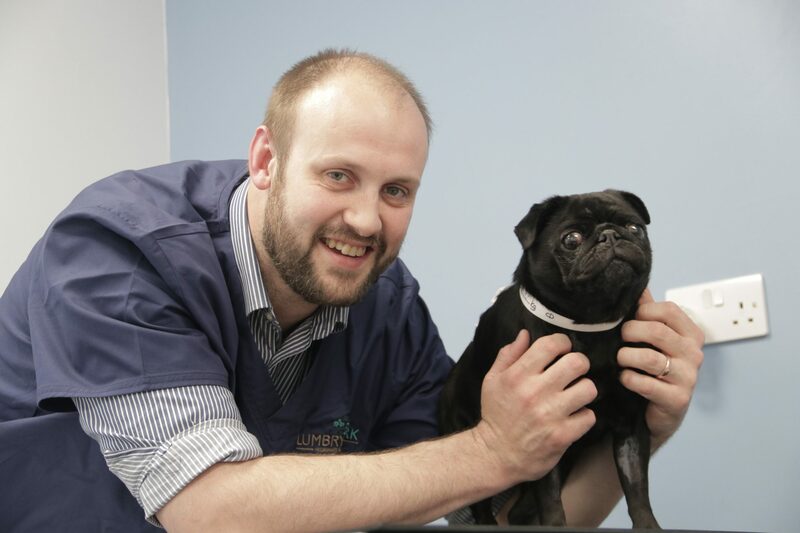 Once deemed stable Ezra was transferred to our Neurology service . Dr Angela Fadda our Neurology Specialist performed radiographs and CT imaging (Figure 1 and 2) . This revealed a complex fracture of the body of L7 with secondary moderate to severe compression of the cauda equina. There was also bilateral moderate pneumothorax and pulmonary contusions but as Ezra was not exhibiting dyspnoea thoracocentesis was not performed. A positive contrast urethrocystogram confirmed that the urinary bladder was intact. Surgery was performed with the collaboration of our Orthopaedic surgeon Dr Tim Sparrow with the support of our team of anaesthetists. A dorsal midline approach was made to the lumbosacral spine. The lumbar muscle fascia was incised and the periosteum from the dorsal spinous process of L6-S1 and the first coccygeal vertebra was elevated. The left lateralised sacral subluxation was reduced using bone holding forceps, and the L7-S1 facet joints were secured using 1.1mm K wires. 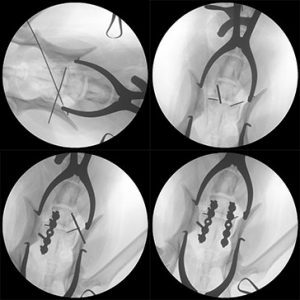 2, 5-hole 2.7mm SOP plates were applied to L7 and S1 under fluoroscopic guidance (please see figure 3), with two locking screws in the cranial and caudal ends of each plate (please see figure 4 and 5). The surgical site was lavaged and closed routinely. 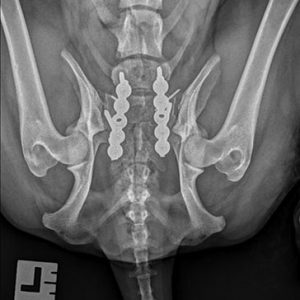 Post-operative radiography confirmed good plate and screw placement. Neurological function improved rapidly in the days following surgery. After 48-hours Ezra was able to stand and walk unaided. Urinary function was normal. Ezra was discharged four days post-surgery with oral meloxicam and tramadol with instructions for exercise restriction. At reassessment at four weeks post-surgery Ezra had a normal gait and was neurologically normal. There was mild discomfort on palpation of the lumbosacral area. At six weeks post-surgery Ezra’s pain had completely resolved and control radiographs demonstrated normal bone healing. 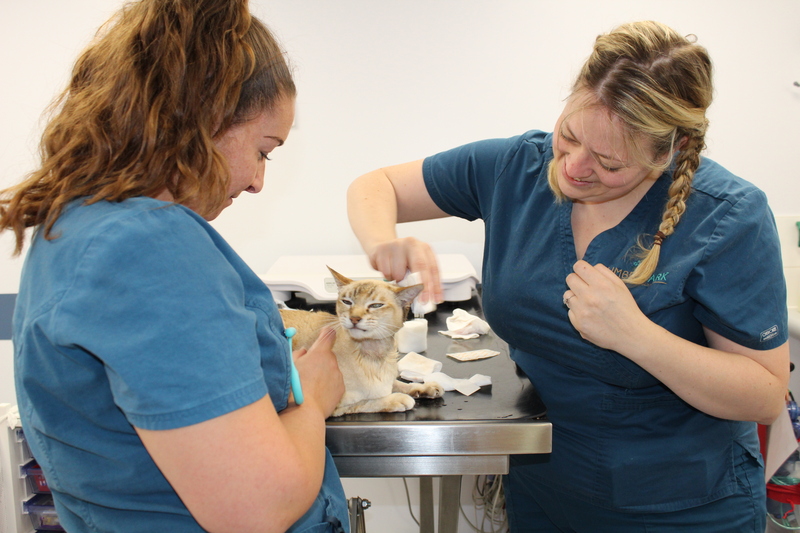 We are delighted with Ezra’s recovery and are so pleased that our multi-disciplinary service was able to fully restore Ezra’s quality of life and return him to his family.